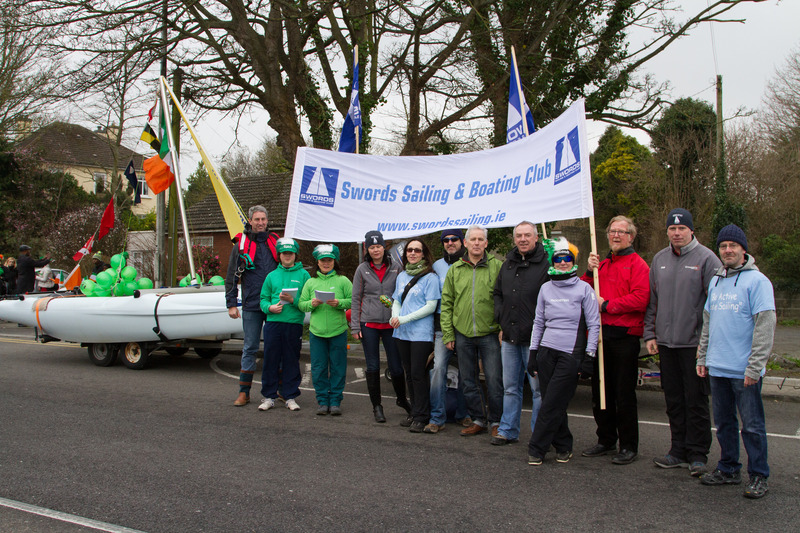 “Excons” victorious at Swords Sailing, season opening, table quiz. An enjoyable night had, everyone was a winner. But in a competitive spirit there can be only one winning team, Excons. The team comprising of back to back winner Jim, Maura, Stephen and Siobhan jumped straight in the lead with a strong first round. Answering “General Knowledge” about Martin “The General” Cahill’s biographer and the drivers of the “General Lee” they scored 9 out of 10. The highest scoring round was only equaled by the Juniors. Team Guesswork won the “Portsmouth Yardstick” round. Somehow adults were familiar with Maui, Logdotzip and Skulduggery Pleasant. Although in the end they were fighting down the lower part of the table with a team of three, “The Sisters”. Who along with “The 3 Stooges” may have suffered from getting seat down the back and not enough teammates. Although that didn’t seem to bother “Patman” as last years Quizmaster scored well with only Amanda for company. Rubix, on the other hand, had a team. One of whom was a junior. They did get top score in the music lyrics round. While many recognised lyrics such as “I am sailing…”, “Let me sail…” and “Watchin’ in the ship roll in…” few recognised “Ship to Wreck” by Florence and the Machine. “Bar flies” score may have been better if they had not been tending and attending the bar. 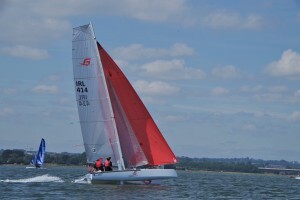 “Spinnaker” and “Suckin’ Diesel” were winners and losers in the mid-table battle. But it was “Eggies” the challenged “Excons” throughout. At one point they took the lead by answering one of the “Questions you don’t know the answer to”, being very precise with the distance to the moon. In the end it was only half a point that separated the two teams. “Excons” taking the plaudits with a final total of 58 points. Monies raised for the RNLI including New years day, total of €530……Well done everyone. Congratulations and good luck Jim as Quizmaster for 2020. 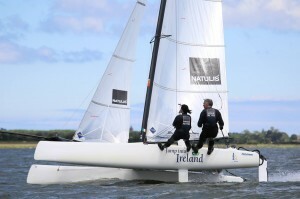 Australian – Mitch Booth is known worldwide for his association with multihulls, having competed at no less then 4 Olympics in the Tornado class; medaling twice. He has also competed in 64 World championships and won 10 of them. He now resides in sunny Spain and is in demand around the globe advising and training with Olympic teams and class associations like ours. Some of us were lucky enough to meet and race against him at the 2017 F18 World’s in Denmark. Armed with some of that secret knowledge, like gladiators ready to tend their chariots we rigged our boats, 1 extra notch here, an extra pound on the Loos gauge there; with brief boat on boat one on ones with Mitch. 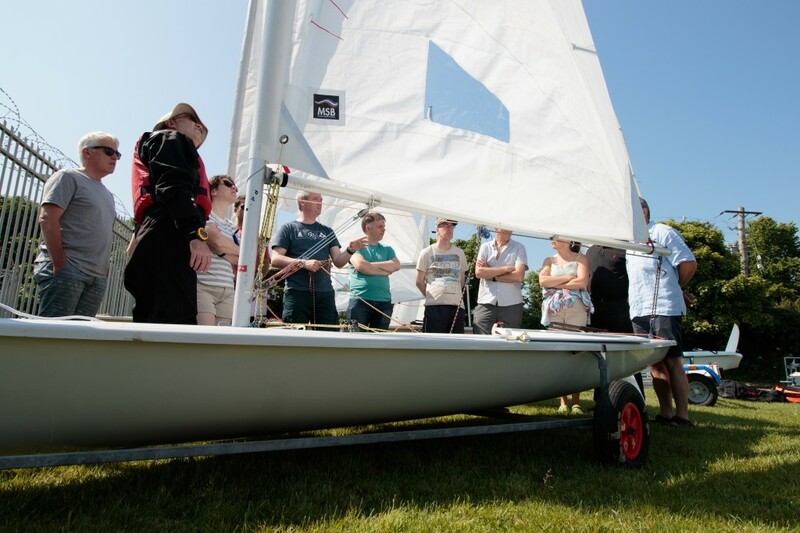 By the time we had finished and got kitted up, we were greeted by the start of a fantastic sea breeze building as we launched our boats for our first on the water session. 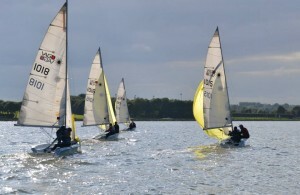 If you have been lucky enough to compete at a World’s or any big fleet racing, you will know that starts are crucial. 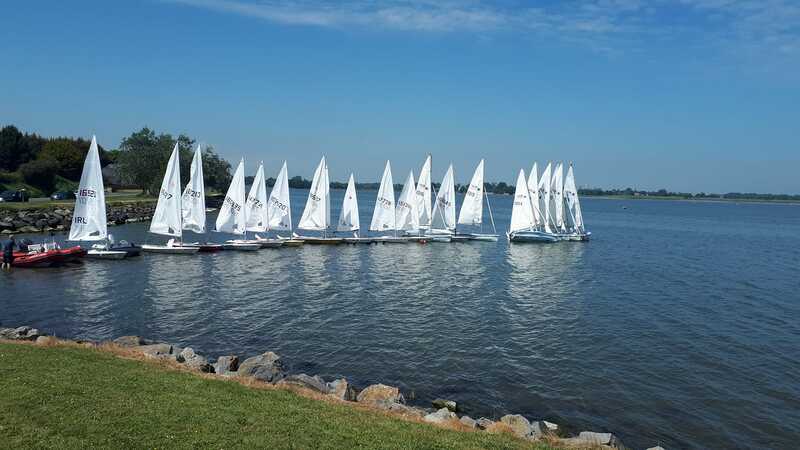 Boat handling is key to parking the boat and making sure you don’t collide with anyone; most importantly that you get away fast into clean breeze from the front row and don’t get rolled or spat out the back. 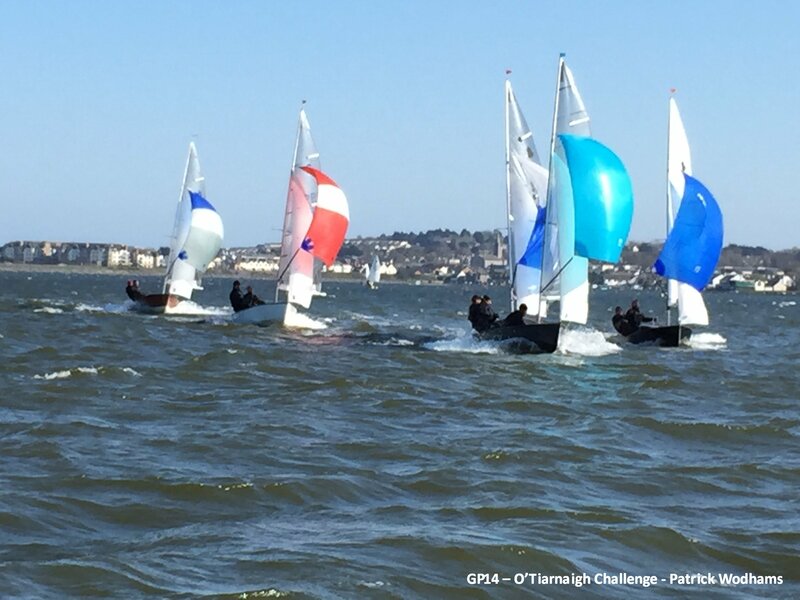 Assistant coach Dermot McHugh and his brother Kevin ferried Mitch around and laid the marks for our quick turn around practise starts, each with varying degrees of success and one or two boats OCS or so we thought. After lunch the fairly constant sea breeze created almost perfect champagne sailing conditions. We progressed to a one lap race after every third start finishing downwind with crews trapezing and kites flying. After a fantastic first day, we headed back into a debrief session utilising excellent drone footage courtesy of Kinga Trojanowska. There was no hiding and the guilty OCS culprits were well and truly outed, all in good jest. A delicious barbecue and refreshments followed with some great stories to be heard form Mitch and all. Day two started exactly the same as day one with the sun shining and not much breeze. Following a quick briefing in the clubhouse, we congregated around one boat in the boat park as Mitch went through rigging and tuning for all the varying conditions. 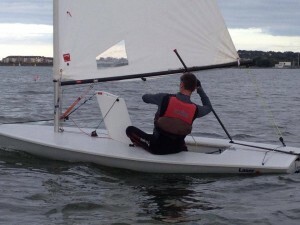 Sail shape and airflow over it, are all influenced by the many controls at the helm and crews disposal, getting them all in the optimum position at the right time is somewhat of a black art; times that by three to include the mainsail, jib and gennaker and you can see why this crucial knowledge separates the master from the pupil. Following Q’s & A’s everybody agreed and enlightened by a true master. joined on the water by quite a few lasers, and other boats that made up the remainder of the Swords fleet. 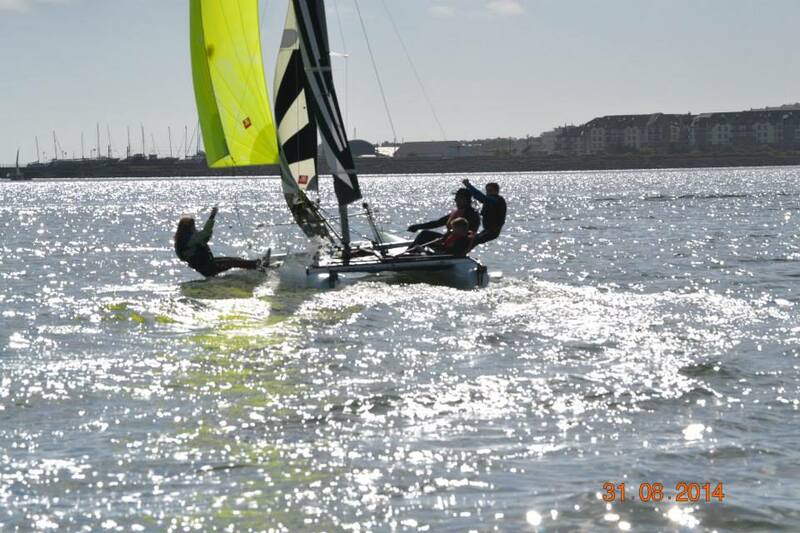 Great fun as we weaved in an out on a fantastic sailing weekend finally. 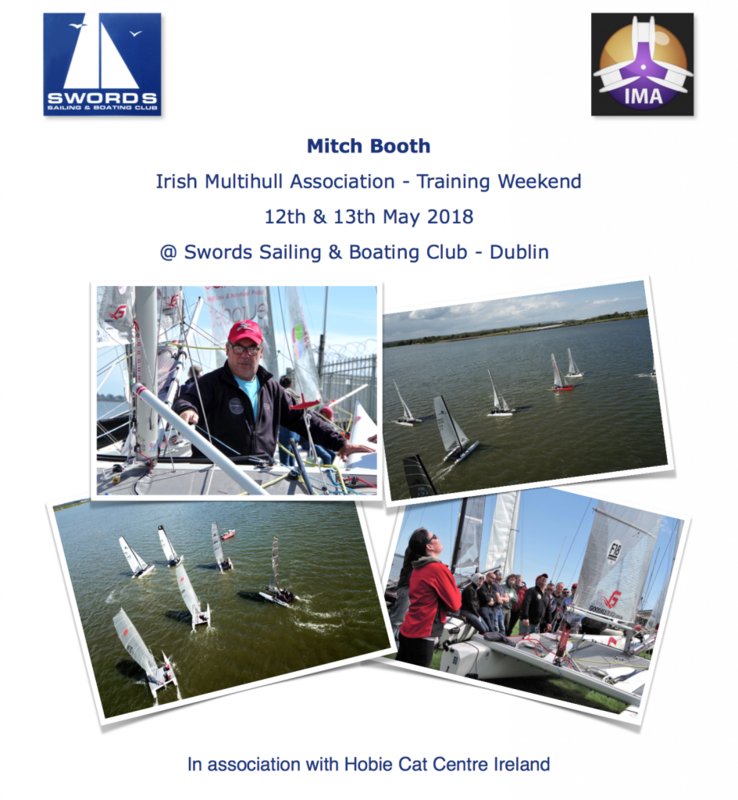 Many thanks to all that helped out over the weekend with special mentions to Dermot, Kevin and Jackie at Swords Sailing and Boating Club & the IMA. 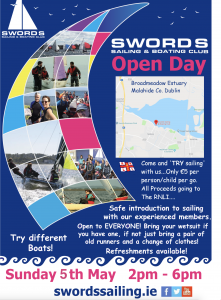 Both Mitch and Swords Commodore Stephen Broaders were interviewed by Fergal Keane for his RTE radio 1 show ‘Seascapes’ (https://www.rte.ie/radio1/seascapes/) Broadcast on 18th May and available on podcast. All images and drone footage courtesy of Kinga Trojanowska. 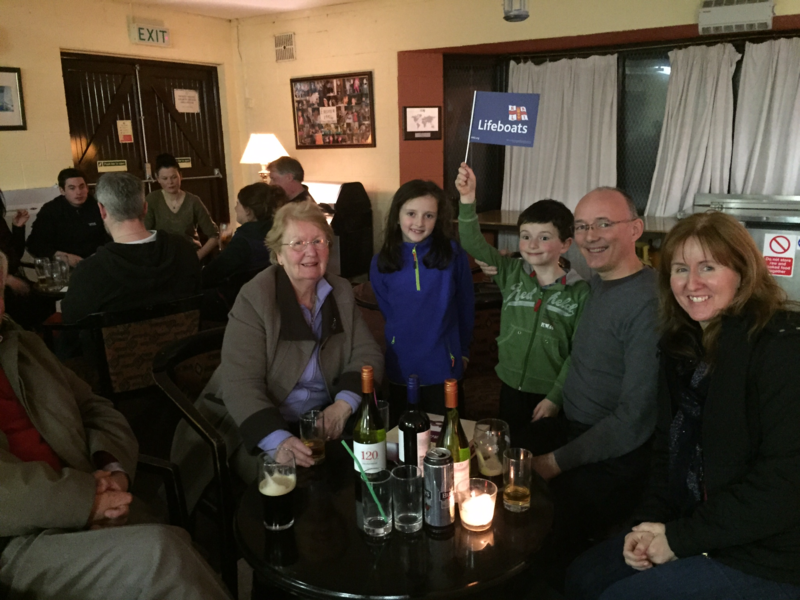 The annual club quiz on Saturday 17th March in aid of the RNLI kicked off the start of the clubs 2017 season. 4 teams battled it out in a great contest. 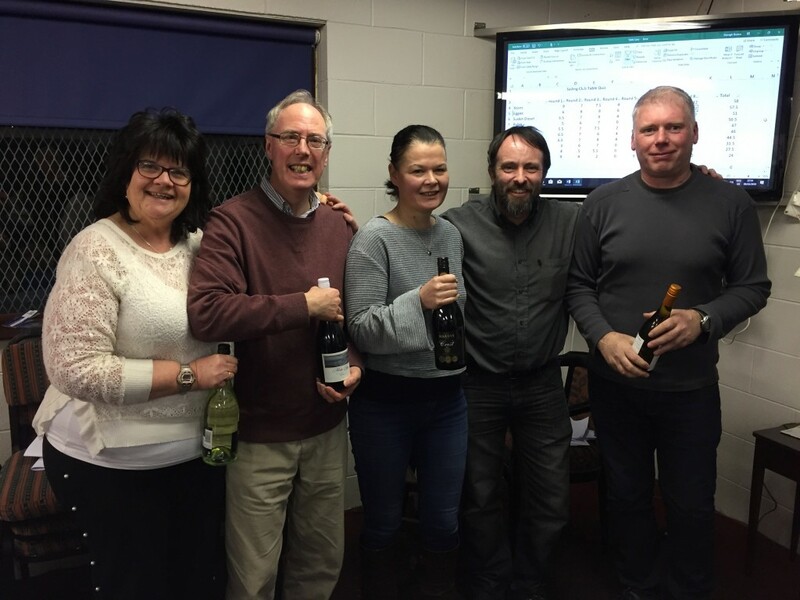 Congratulations to the winners.. team name: ‘Rosena’s Boy’s’ – Rosena, Jim & Darragh with quiz-masters Paddy & Amanda. There were 6 rounds of 10 questions each, with questions ranging from.. ‘How many senators is the Seanad Éireann composed of?’ The answer was 60. ‘Where was Donald Trumps mother born?’ Scotland. Other questions had a sports and Rugby theme as England had lost earlier on in the six nations rugby. A tricky question..‘At what height is the crossbar on Rugby goalposts?’ 3 metres! The Cheltenham Gold cup had taken place that week so the following question would have been relevant too anyone who had backed it...’Who won yesterdays Cheltenham Gold Cup?’ and of course the answer was Native River! 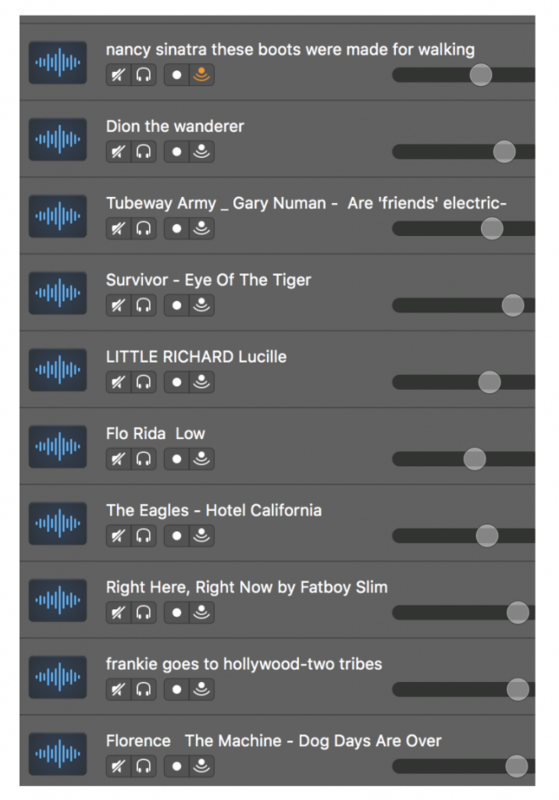 There was a name that tune round consisting of 10 tunes. 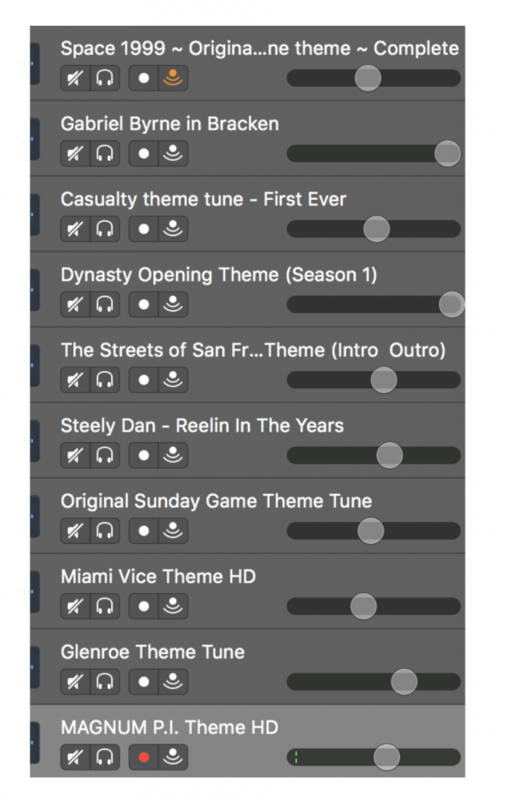 A 5ish second piece of each tune was played. With teams nodding away remembering the tune, but who was it by? and what was it called? 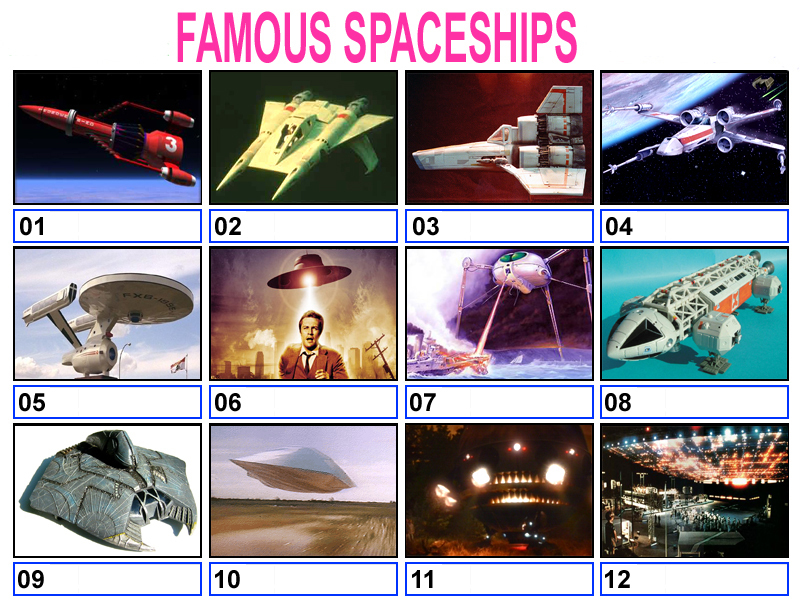 There was also a name that famous TV series round, again a 5 fish second clip played. And again all teams going I know this, but what was it? 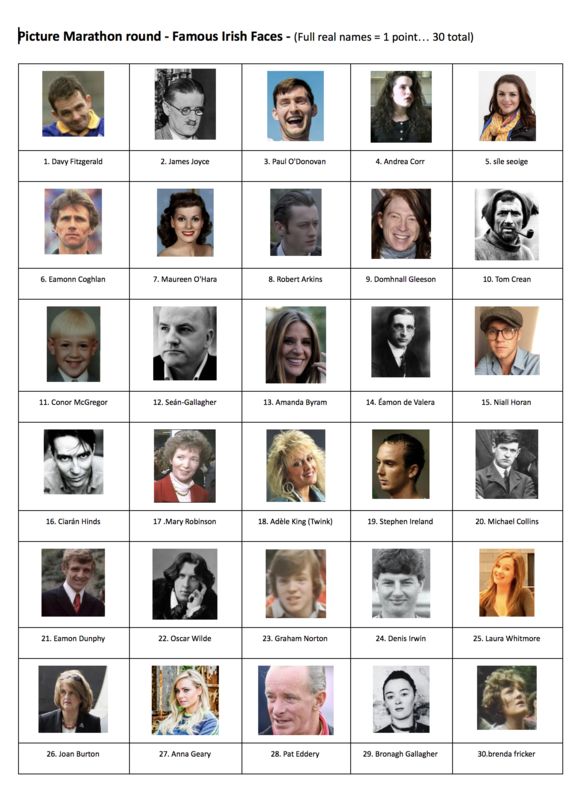 A marathon picture round of 30 famous Irish faces was introduced just before the half time break which proved interesting and gave everybody time to complete as it was the final round collected at the end. It was decisive with Rosena’s boys getting 20 out of the 30 faces correct. In 2nd place were ‘Raincon 2′ followed by the ‘2415’s and ‘DB1’….There was a raffle with prizes Kindly donated by some team members. 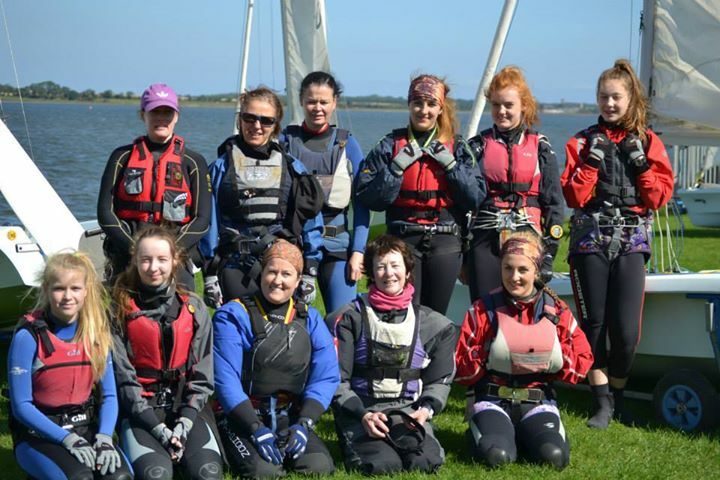 Monies raised for the RNLI including New years day, set a new record total of €900……Well done everyone. 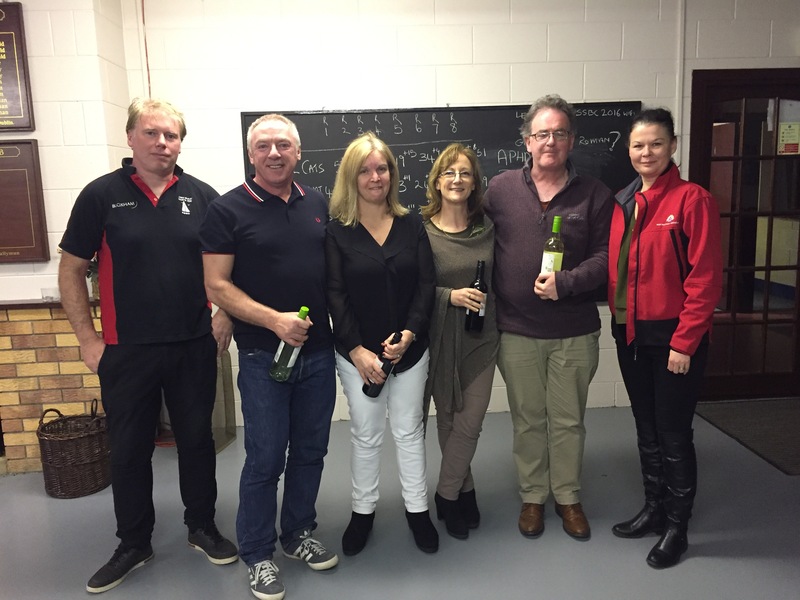 Thanks to our quiz master’s Patrick Wodhams & Amanda Green who have passed on the baton to winning team member Darragh for next year…….. This year eight of us defied the inclement weather predictions and met up at Scholars Pub near Oldbawn for our annual Christmas walk. Conditions were overcast with a strong north westerly wind. At 11.15 we moved off to our starting point on the Kilbride Rifle Range road. Our principle objective was the summit of Seechone Mountain. 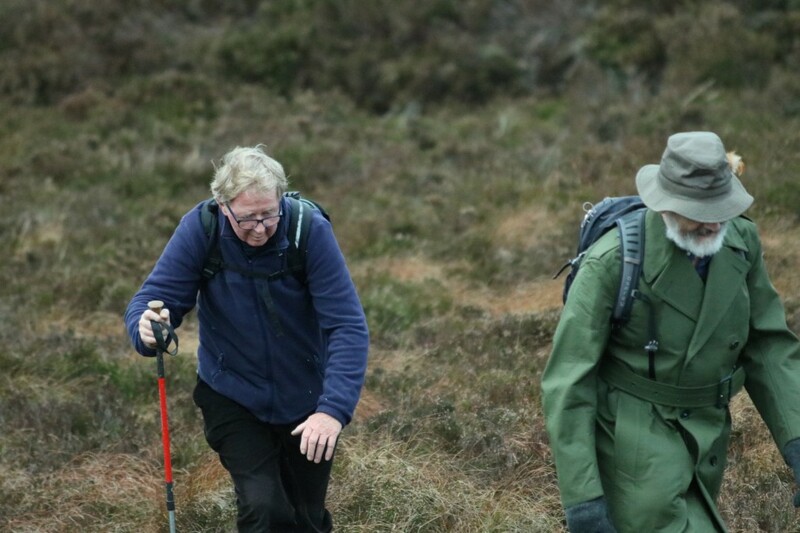 We followed a trail through Seahan Forest till we picked up the ridge which led us top the top of Seechone. Up to that point we had been well protected from the biting wind. But at the top it was a different matter. On the way down the mountain we again picked up a trail through the forest leading us back to our cars. The 10km took us a little over two hours to complete. We all returned to Scholars for a quick coffee and home. 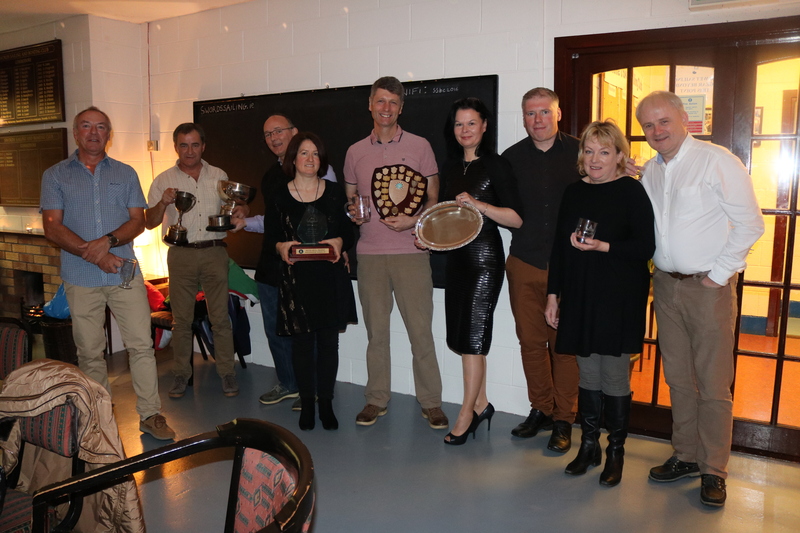 The annual club quiz on Saturday 25th March in aid of the RNLI kicked off the start of the clubs 2017 season. 6 teams battled it out in a great contest. 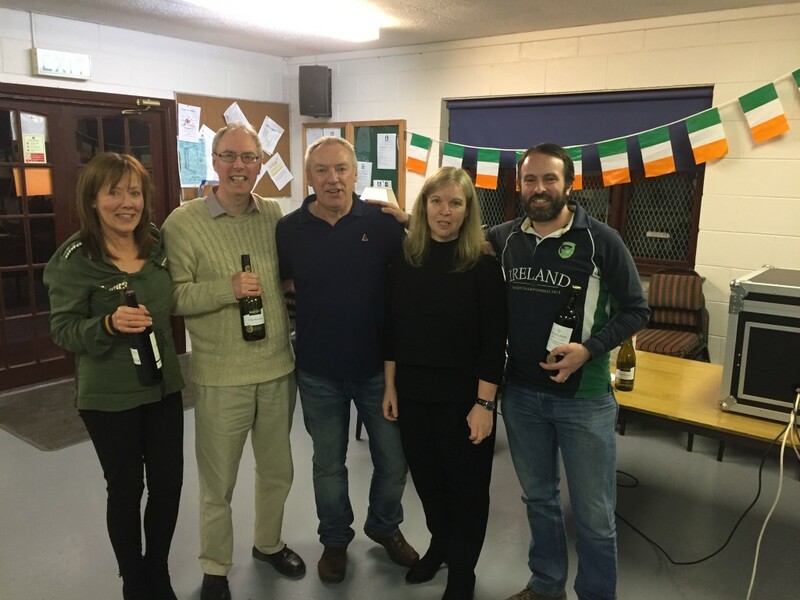 Congratulations to the winners.. team name: ‘Neighbours’ – Paddy, Amanda, Sharon & Seamus with quiz-masters Stephen & Siobhan. There were several rounds with a good selection of questions ranging from.. “What was Mexico’s boarder length with America?” A 4 answer multi-choice question! For those in the know the correct answer was 1,951 miles! Another multi-choice question was “What was the circumference of the moon?” If you are curious then the answer was 10,921 km. 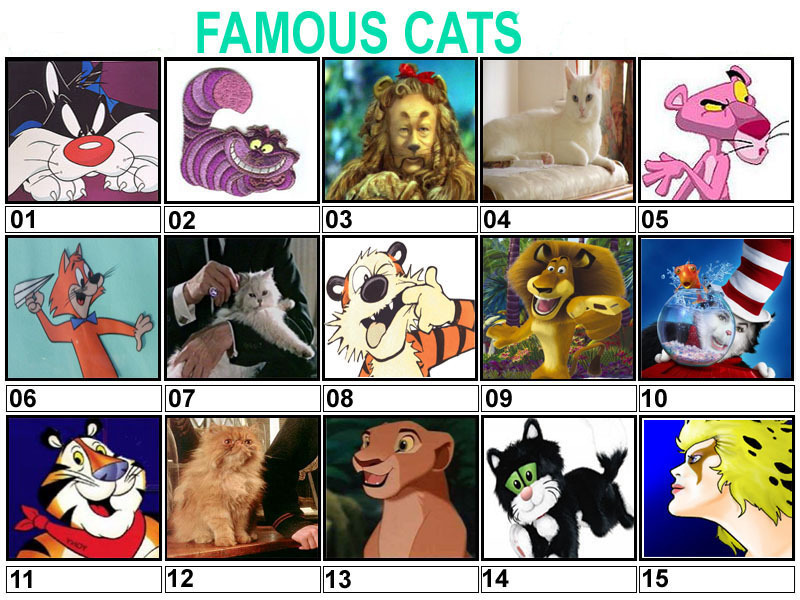 Following with tradition, there were the usual and very challenging picture rounds, one of which was to identify ‘Famous Cats’ and the other ‘Famous spaceships” ……….Buck Rogers @ no 2, The Invaders at no 6 and Flight of the Navigator @ no 10 and cats’ No 15 Cheetara from ‘Thundercats’ were all to prove tricky, but were a deciding factor for the eventual winners Neighbours who’s knowledge of these 2 rounds ultimately gave them victory. They were run close by last years winners Fingal flyers who finished 2nd, so well played to them. Monies raised for the RNLI including New years day, set a new record total of €600……Well done everyone. They have done a great job in recent years and will be handing over the quiz-master reigns to Paddy & Amanda who will be your quiz-masters for 2018.